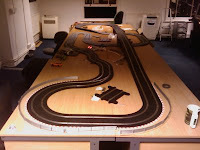 If you know me then you'll also know of my dream of having a Scalextric track running around the entire office, streamed live online, web-cams on each of the cars and opponents controlling cars via a web-based control system on our site... well, we're not quite there yet but today our layout took a step towards that goal. Today I added the radius 1 hairpin bend that you can see in the top left in this picture and a 10 degree radius 3 banked curve that you can see sweeping around the top. Practically, allowing for room to walk around, the Kempt track now takes up about a quarter of our office! Having briefly tested the track it's very definitely going to provide thrills and spills, I can't wait to down tools and have a proper race!